There are no doubts that our campaign @ Returning Home since 2015 to successfully redefine the role of the typically uninspiring cremation urns vanish quickly whenever anyone steps into our shop, or visits our Website and FB page. 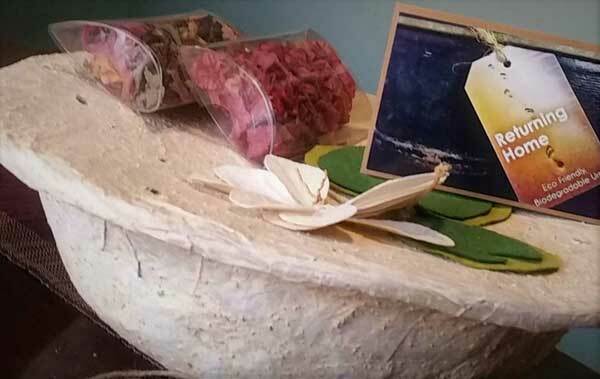 The first of its kind shop stocks and exhibits commissioned and handmade funerary urns, coffins, shrouds and stationery in an eclectic presentation. It is one that shows how people across the globe are developing entirely new metaphors for how the character of a unique life can be reflected in their hands and in all media. Each piece in the shop is available to view online on our FB page and on the Website where you can place an order and make a direct payment. Our FB page also provides an environment where people can see some of the more modern examples of funerary objects from around the world and learn about funeral practices from ancient times. At Returning Home’s shop, it's not unusual for visitors to wonder about the diversity of items where they can touch, talk and inquire while exploring and where there are no gaudy dangling price tags. Like any other shop the origins, functions and prices of the items are always available and staff are ready to answer any questions about the pieces on show and to follow up on inquiries for in stock and for specially commissioned work. We are careful that every item we sell and display does what it claims to do, is of a high quality and visually beautiful. All Urns are selected for their function as well as their meaning and we always acknowledge the designers themselves — sharing with purchasers the stories behind the designs and discussing global or artistic awards. It’s obvious that all Urns are made with attention to detail and courage in creating original forms in the broadest range of applications, therefore some Urns are made to be buried and others to be released into water. 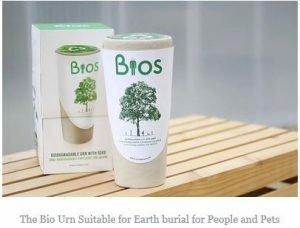 Two of our most popular Urns are the Bio Urn which was developed by the team @ Bios located in Spain and the Living Urn which is awaiting patent status. 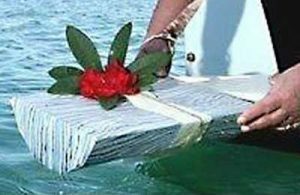 As the owner operator of the business Returning Home, I have spent a vast amount of time researching the changing needs of populations across the globe and also the environmentally aware burial phenomenon. As a designer with a keen sense of environment I create my own urns. I divide my time between Palliative Care work and Funeral Assistant for a local Funeral Home. I am also a keen supporter of the Home Funeral and Natural Burial and Assisted Euthanasia movement which has become a great part of our current cultural dialogue. I also hold Death Cafes and Death over Dinner events when there is time. 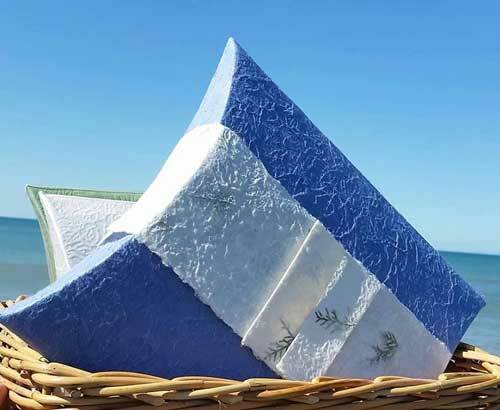 Returning Home has established a special niche in contemporary funerary items since opening their on line business in 2014 debuting in Mildura in the North Western part of Victoria. As a unique boutique business we have opened new opportunities for artists providers of funerary items a shop front and on line platform to show and sell their work, we believe we have helped the public broach a difficult subject in the most gentle, often charming, frequently provocative and always meaningful way. 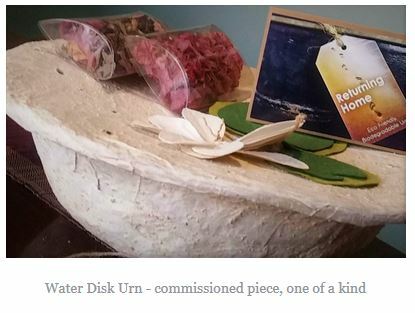 On a Sunday afternoon at an unassuming home, the shop front gallery in Mildura Victoria, visitors waited patiently for the doors to open to the first open-to-the-public-display of original, contemporary, artist-made urns, vessels, reliquaries and memorial funerary objects. Since that defining moment, Returning Home has steadily grown in it’s following and reach. It is from the FB, webpage, radio interviews and magazine articles that people have become more aware and eager to explore this genre, and for the public to see and acquire the most beautiful funerary pieces being made by artists worldwide today.